Bulk carrier freight rates may be in a long-term dive, but this is not stopping classification societies from seeking to expand their fleets and pushing forward with new design innovations and safety rules. The heat may be on bulk shipping margins, but classification societies are continuing to build up service portfolios aimed at the sector in a bid to boost fleet sizes and revenues. Take Bureau Veritas, one of the market leaders in dry bulk shipping. 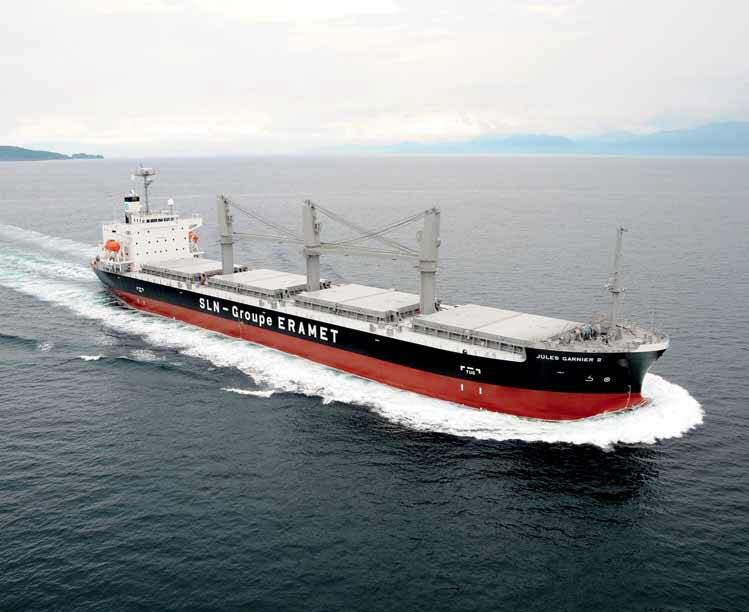 Konstantinos Chatzitolios, BV’s manager for dry cargo, told DCI that BV’s bulk carrier fleet at the end of 2014 stood at 1,024 vessels aggregating 68.8m dwt, as well as 150 vessels of some 11.7m dwt on order with shipyards. ClassNK is similarly bullish. Yasushi Nakamura, Representative Director and Executive Vice President, ClassNK, said that after a steady year the society had 8,872 vessels totalling over 232.8 million GT on its register at the end of 2014, with bulk carriers representing the largest portion. DNV GL, meanwhile, has also been pushing forward with design advances for the sector as part of its push to secure more market share (see box ‘DNV GL: new market superpower’). As regulations on harmful ship emissions such as sulphur become stricter, reducing SOx, NOx, CO2 and particulate matter will be at the top of the agenda for many players in the maritime industry. DNV GL believes this will encourage owners and operators to explore fuels that ensure compliance and maximize fleet and vessel efficiency. The society presented Oshima Shipbuilding Company with an Approval in Principle (AiP) certificate for a LNG-fuelled Kamsarmax bulk carrier at the Nor-Shipping exhibition in June. The new Oshima Kamsarmax is designed for dual fuel operation, using both LNG and HFO to power the main engine, the generators and the boiler. This allows fuel usage to be adapted depending on when the vessel enters or leaves an Emission Control Area to reduce LNG usage. The new design complies with DNV GL class rules and all current and upcoming regulations, including the new emission control regulations and the draft IGF Code for fuel with a low flashpoint, according to the society. Moreover, because space on bulk carrier decks is limited, the Oshima Kamsarmax design also features an innovative U-Shape superstructure to accommodate the LNG tank in its centre. This approach allows the accommodation deck house to be completely separated from the LNG storage tank as well as scalability in terms of the amount of LNG storage available onboard. together with its head office in Tokyo, offer 24-hour coverage of survey enquiries on a global basis, as well as rapid responses when dealing directly with clients and flag state administrations. Class NK has been to the fore in the reduction of risk when it comes to the liquefaction of nickel ore, a major cause of deaths at sea and loss of bulkers over the last decade. First the society produced its Guidelines for Safe Carriage of Nickel Ore which compiled the loading requirements and transport procedures of the IMSBC code, with best practices, precautionary measures, and recommendations for safely loading and transporting nickel ore gleaned from onboard operators. These standards were first approved by the Panama Maritime Administration and later by a string of other flags.“The 27,000dwt open hatch bulk carrier Jules Garnier II was the world’s first vessel built to the Specially Constructed Cargo Ship requirements, constructed and designed by Naikai Shipbuilding Corporation to NK-class and delivered to JX Shipping Co. Ltd on 19 September 2012,” added Nakamura. ClassNK has also been involved in a European Joint R&D project called LiquefAction which it joined in September 2014. The project aims to better understand the physical properties of cargo liquefaction in order to prevent bulk carrier casualties and is being carried out by a consortium of Europe’s top research institutions with support from German shipowner Oldendorff Carriers. Nakamura also said owners should be aware that the IACS Common Structural Rules for Bulk Carriers and Oil Tankers (CSR BC & OT) had entered force on 1 July 2015 and applied to all bulk carriers over 90m and oil tankers over 150m in length. “These new rules bring new requirements for more comprehensive structural analysis at the design stage, including FEM analyses covering the entire range of cargo hold structures, as well as new formulae for buckling, fatigue, and residual strength criteria to enhance safety and reliability,” he said. “However, these new requirements also greatly increase the overall time needed for vessel design. BV certainly has no intention of being left behind by its ambitious class rivals, not least when it comes to helping its partners meet the demands of the latest regulations. “Bulk carriers represent the strongest market segment for BV's marine business, accounting for almost 25% of total revenues,” said Chatzitolios. “We continue to invest in this market in order to maintain our strong position. “In previous years we have engaged in a major campaign to train shipyards and designers in the new Harmonized CSR and relevant BV software tools. We have also worked with them to examine their existing CSR designs against the new rules and to be able to produce even more optimized designs. RINA has reaffirmed its long-standing commitment to safe transshipment standards in the bulk sector by revising its rules for offshore cranes used in construction, service and demolition. The Italy-based classification society has been a forerunner in the auditing of transhipment standards, not least through its work with designers including Logmarin. Previously this has seen the development of service notations for transshipping units and floating terminals which have been assigned to non-propelled and assisted propulsion units designed for the transhipment of dry bulks. Building on previous rules and notations, the society has now re-based its rules for offshore cranes, splitting the requirements for specific crane types (ship, offshore and transhipping) into free-standing sections to make the rules more user-friendly. For example, the new RINA rules for transhipment cranes provide a specific notation — CARGO HANDLING — which has already been assigned to the floating crane transshipment unit FC ASIA BELLA, built by China’s Chengxi Shipyard for the Indonesian owner Pt. Pelayaran Mitra Kaltim Samudera. The service notation of units operating permanently anchored or moored in a fixed location is competed by the additional class notation MOORING, to attest that the mooring system is certified by RINA. The new transhipment rules take into account both static and dynamic loads on cranes used on vessels transhipping bulk cargoes in open waters, and also detail how these are related to structural requirements for the vessel and crane. The revised rules for offshore cranes have been based on European Standard EN 13852, which RINA said takes a different and more modern approach to commonly used offshore crane standards. “There is a gap in the market for standards for transhipment cranes,” said Dino Cervetto, Director of Technical Services, RINA Services. RINA’s new rules contain an operational chart which Cervetto said would allow operators of floating transhipment terminals to widen the weather window in which they can work, and also takes into account the specific wave height and orientation of the terminal. “The new rules for transhipment cranes cover certification of cranes engaged in open sea operational use including cranes installed on storage bulk/ore carrier for transshipping operations or cranes installed on transhipment units,” he said. “The crane working envelope is defined with a matrix that correlates the wave height with the operational criteria. A table correlating maximum operational wave height and characteristics of the vessels involved in the operation will be annexed to the certification. “The intention is to provide a structure which ensures that the cranes chosen for open sea transhipment are fit for purpose and can withstand the stresses caused by movement in multiple dimensions which are typical of open sea transshipment. “Cranes certified under this new notation will be able to operate safely for longer and give more operational time to terminal operators without fear of breakdowns or overload conditions. The bulk carrier sector is a key target of classification giant DNV GL, the (relatively) new superpower among classification societies which was formed in 2013 by the merger of European stalwarts DNV and GL. DNV GL’s registered fleet amounted to 265 Million GT at the end of 2014. Of this total, bulk carriers accounted for 44.1 Million GT. In terms of vessel numbers this translated into a total fleet of 13,174 ships, 953 of which were bulk carriers. The society would not comment on its current market share of the bulk carrier sector but So¨nke Pohl, Key Account Manager and Ship Type Expert for bulk carriers, said DNV GL was working tirelessly to diversify its dedicated bulk carrier services portfolio as part of a push to draw in more owners and operators. DNV GL has now issued its plans for new rules to more than 800 customers and stakeholders, part of an extensive external hearing process before their publication and entry into force. The rules being developed — which the society said would become its ‘signature’ and would be practical, clear, consistent and easy to use from the design stage onwards — will essentially form the basis of the organizational strategy of the classification behemoth as it attempts to position itself as the global maritime safety leader. Once DNV GL has received feedback from its customers and stakeholders, this input will be processed and incorporated into the rules which will be launched and published in October and will then enter into force on 1 January 2016.